Jack Bell Gallery is thrilled to present a solo exhibition of paintings by contemporary artist Raquel van Haver. ‘Metro 54’ brings together two mural scale paintings along with a new series of small intimate portraits. 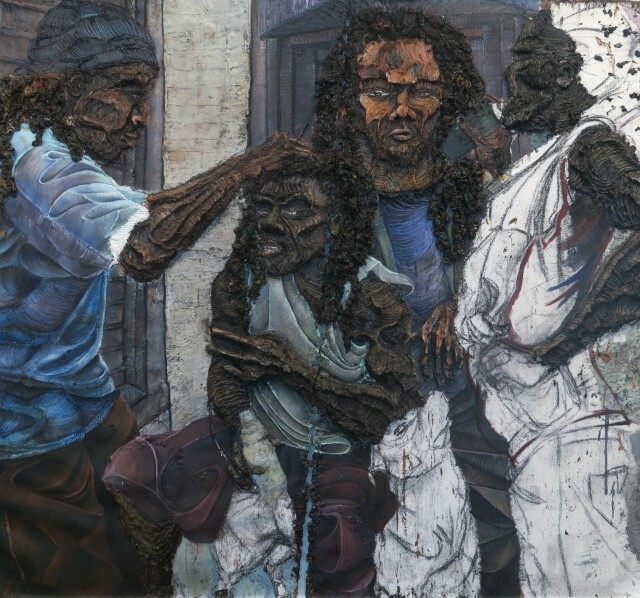 She works on burlap, often combining oil paint, charcoal, gypsum, newspaper and ash in heavily textured compositions. This will be her first exhibition in the UK. Van Haver makes paintings that offer snapshots of daily life in the South-East of Amsterdam, Netherlands, where the artist lives and works. She is interested in race and identity, drawing from African, Western, Caribbean and Latin American cultures within her direct neighbourhood. Her work is raw and masculine, at times monumental and energetic, at others dark and ominous. Negotiations between ‘self’ and ‘other’ appear as recurring themes. The artist skilfully fuses great traditions of painting and the more contemporary practices of graffiti in her surroundings. She begins by collecting imagery, either found or from her own photography and sketches. These are then deconstructed and fragmented through collage to produce a new reality. Surface and subject are finally merged into relief using thick layers of oil paint. The stories they tell are recognisable to the viewer, but left open and inviting interpretation. Van Haver was born in 1989 in Bogota, Colombia. She lives and works in Amsterdam, Netherlands. In 2012 she graduated from the HKU, Fine Arts, Utrecht. In 2012 and 2013 she was nominated for the prestigious Dutch Royal Prize for Painting.